How do you meet their expectations and manage an extensive field force? With a system that provides instant dispatch and reliable communication, no matter where they go. One so efficient and easy to use it can improve worker safety, reduce operating costs and improve customer service. MOTOTRBO is remastering digital two-way communications â€“ and redefining what customers expect from a radio solution. With the MOTOTRBO portfolio of portable and mobile radios, repeaters, data applications, accessories, software and services, you can put the right device into the hands of the right user. From the dispatch center tracking workers, to field work crews, to the technician repairing trucks, MOTOTRBO radios help increase efficiency, productivity, and safety. 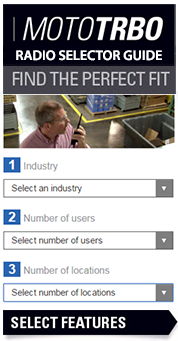 A MOTOTRBO digital two-way radio system keeps facility management and workers as well as workers in the field connected in real-time to ensure the safety and security of employees and to drive operational efficiency throughout plant and field operations. "We have coverage issues around the outside edges, including a couple of substations that are in rougher terrain. We have hills and bluffs and several dead spots with the analog system," says Greg Salmons with Callaway Electric Cooperative. "Whenever you try to contact your crews and cannot reach them, there's the fear in the back of your mind of making sure they are okay. Having constant, reliable communications with those in the field is very important â€“ especially their safety given the type of work they do." Instant private and secure communications with enhanced or basic privacy options. Tracking of vehicles, personnel and assets. Increased workforce productivity and efficiency. Employee and facility safety and security. Minimized risk and legal exposure. Track your vehicles and your staff for improved safety, security and accountability. These applications allow you to make the most of MOTOTRBOâ€™s GPS capabilities, and some even offer indoor location tracking capabilities. 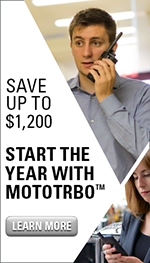 To get the best from your MOTOTRBO system, you need to know how itâ€™s performing. These applications give you a dashboard view of key metrics and parameters, with detailed logs helping you plan future growth and upgrades. Communication amongst and between groups of people is a critical part of the day-to-day operations of any organization. For some organizations, mission critical communications are inherent to the organizationâ€™s mission. This is true of organizations ranging from the military to workers on an oil rig where efficient communication can be the difference between success and failure â€“ and between life and death. The WAVE Work Group Communications solution is a software platform and suite of applications that remove the technical barriers to secure instant communication across any IP network. WAVEâ€™s resiliency has been tested in some of the worldâ€™s most difficult environments including battlefields, mines and the aftermath of natural disasters. The following paper describes how WAVE creates the infrastructure required for software-based mission-critical communications. The paper provides an overview of the basic components and technologies that make up WAVEâ€™s core platform and the suite of end-user applications. MOTOTRBO batteries are developed, tested and certified for optimal performance with your MOTOTRBO radios and they outperform other brands of batteries. Reduce the number of spare batteries you buy with IMPRES™ batteries. IMPRES batteries can be charged 150 additional times versus a standard battery â€“ a 43% increase in charge cycles. Choose from single-unit, multi-unit, travel and in-vehicle chargers and be confident your radio is ready when you need it. Get the most out of every battery and eliminate the surprise of "low battery alerts" with IMPRES chargers. For more information on how MOTOTRBO can improve service throughout your service area, contact us today.